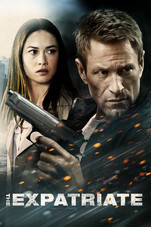 This week, Aaron Eckhart throws his hat into the cerebral action hero ring for Philipp Stölzl’s The Expatriate (Erased, 2012), an American espionage thriller which has more than a whiff of déjà vu about it. Imagine a less icily-efficient Jason Bourne, with a petulant daughter in tow, and you’re somewhere close to what’s offered up here. The Dark Knight’s former nemesis, Eckhart, plays the titular character, Ben Logan. Forging a new future in Belgium after a dark past, he’s juggling daddy duties with his recently-displaced older teenage daughter Amy (Liana Liberato), whilst working as a consultant for a high-profile security devices company. Returning to his Brussels office the day after identifying a product error, Logan finds that not only is the place completely deserted and cleared out, but the neighbouring office complex in Antwerp has no record of the company or his employment. Figuring out that his old skills are being exploited for nefarious purposes, Logan goes on the run with Amy to escape the killers on their trail, uncover the truth and attempt to get his life back. Having debuted on iTunes here in the UK a week or so back (followed by an understated one-day cinema run) the signs don’t look too good for The Expatriate. In truth, it’s a competently-made action picture, if lacking a little character, and its enlivened somewhat by the casting of both Eckhart in the lead and Ukrainian-born actress Olga Kurylenko. Eckhart brings a weight and gravitas to the role, and for the most part, he’s given more foibles than those other recent government operatives-turned reluctant heroes. With elements of the aforementioned Bourne franchise, and also a pinch of 2008’s Taken, the film could almost be mistaken for one of Luc Besson’s action factory products. What sets The Expatriate apart from the aforementioned is a downplaying of the action scenes, and a little more to chew other than salty popcorn. That’s not to say every genre clichés isn’t here in some form or another. Professional CIA figures run around killing innocent bystanders in an indiscriminate and sloppy manner, and Logan’s ex-agent who has since developed a conscience is hardly new ground. However, it’s nice to see some brief snipes at US imperialism, and even a vague immigration subplot factored into the thrills and spills. Those looking for an undemanding evening of real-world action beats could do a lot worse than Stölzl’s run-around.